Here is my example of this status of the firewall and the allowed ssh rule and Port. We are going to need to install Putty on the Windows workstation Here the link. 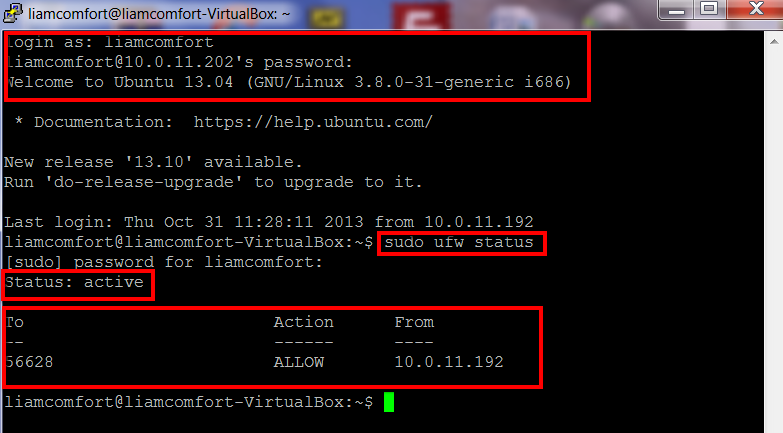 Once Putty is installed you need the IP address that you obtained from the Ubuntu virtual environment. Place it in the HostName and the Port 56628 in Port location. Make sure SSH is selected and click open. Once a connection is established you will be prompted for Username then your password. Now you have made a successful SSH connection using a different port number then 22.